David Price got hit by a piece of a broken bat and then Joe Maddon had some comments about maple bats in general. He doesn't like them. But how many Rays/Bulls use them? So it seemed a good time to add some links I’ve been hanging on to for a couple of weeks. 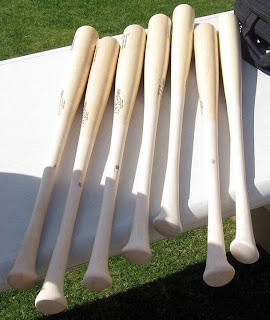 One is about a new bat handle shape apparently being tried out by some Seattle Mariners this spring. Odd looking critter, but makes sense. Gotta wonder what it feels like. Another is that at least some varieties of maple bats are being banned in minor leagues, but I haven’t been able to find any follow up to see if it will apply to the Bulls this year. Yet another rumor regarding a sequel to Bull Durham has surfaced. Sure would be fun to have it done, but I’m beginning to think that the opportunity has passed. Steve Slowinski over at DRaysBay an interesting piece on “park effects”.